In order to best serve its objective of maintaining price stability, the ECB, like any other central bank, needs to thoroughly analyse economic developments. 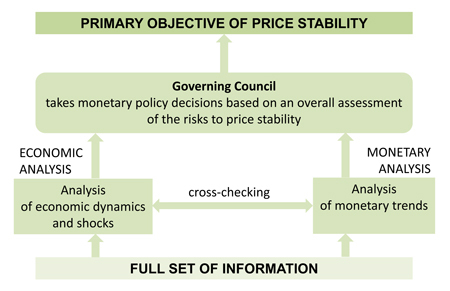 The ECB's approach to organising, evaluating and cross-checking the information relevant for assessing the risks to price stability is based on two analytical perspectives, referred to as the "two pillars": economic analysis and monetary analysis. They form the basis for the Governing Council's overall assessment of the risks to price stability and its monetary policy decisions.